Come and join Wendy Van de Poll, Animal Guidance Communiator as she opens your world through the voice of animals! Find out What Your Animals Know About You...That You Don't! Wendy connects with animals living, those who have passed and the wild animals among us! Beyond Animal Speak Radio -Find and Support Your Animals Vibrational Energy! Beyond Animal Speak Radio - Ways to Deal With Lyme Disease in Your Animal! 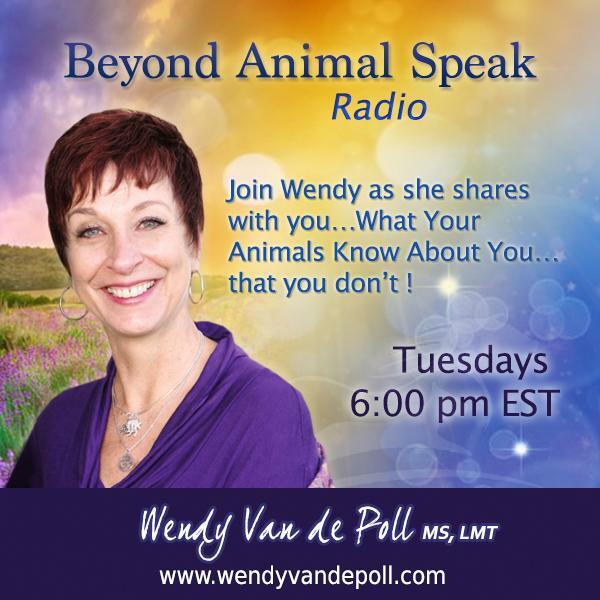 Beyond Animal Speak Radio - What Does Your Animal Know About You! Beyond Animal Speak Radio - Dancing with a Wasp! - An Unexpected Soul Contract! Beyond Animal Speak Radio - Just People! - Listen to Your Intuition! Beyond Animal Speak Radio- Animal Totems-Part 2! Call in to find out yours! Beyond Animal Speak Radio- Animal Totems Revealed! Call in to find out yours! Beyond Animal Speak-Just Me!-Discovery Sessions!